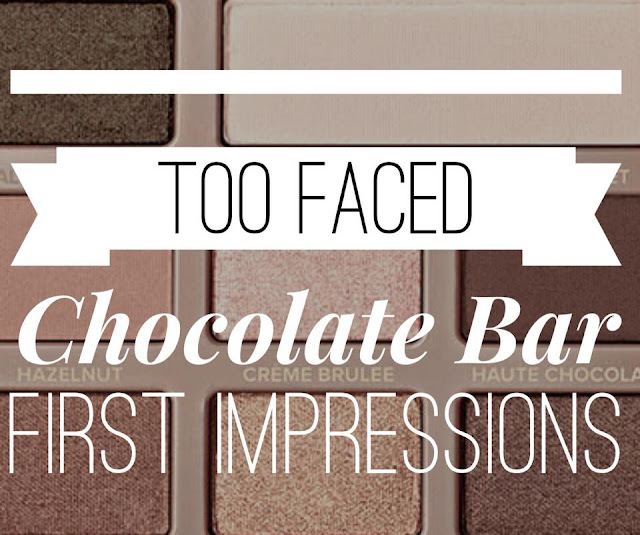 I know I'm late to the party with purchasing this palette, but I'm sure a few others out there are still um-ing and ah-ing over Too Faced Chocolate Bar, so I thought I'd do a first impressions post, complete with swatches if you needed some help! The packaging of this palette is really nice in my opinion. I like the design of it, looking like a chocolate bar, because I am definitely a chocolate fan! The cardboard box it came in is designed like a chocolate bar wrapper, which I think is sweet (pun intended), since it maintains the theme in a clever way. On the back is a guide to the shades, which I think would be useful for people shopping in person to see the shade selection. Ingredients and weights are also included. The actual palette is in a metal tin, so it doesn't feel cheap. It's slim and compact, but still feels sturdy. On the inside, the pans are packaged in a plastic casing. This casing on mine looks a little bit like it's poorly formed in places, but I'm not sure if this is part of the design? If they were going for a marbled effect (it sort of looks like it) it's a nice touch, but I think they should include more of a marble texture if that's the case. If it's just a manufacturing issue, it needs to be fixed in my opinion. I don't want a scruffy palette for nearly £40. There's a nice clear mirror in the lid which is very useful for makeup on the go, but it would have been nice if it took up the whole lid rather than leaving room for the 'Chocolate Bar' writing. Honey, it's on the box and the tin, and I BOUGHT IT. I know it's the Chocolate Bar palette, I don't need you to tell me when I open it up as well. The palette closes with a magnet, so it's secure and won't pop open in your bag. Overall, the packaging is well designed and feels high quality. One of the major things people talk about with this palette is that it smells of chocolate. When I first opened it to take pictures for this post, I'd forgotten that. And I didn't remember until about twenty minutes later. That's because the scent isn't strong enough for me when you first open the lid. You would expect to be hit by the scent as soon as you open it, but it just didn't happen. In fact, when I first actually sniffed it I could still barely smell it! However, after smelling it a few more times I can say that it is definitely there, and it's a pleasant chocolatey smell. I suppose it's a good thing that it's not offensively strong, but as I like the scent I would have liked more of it. The shade selection is very nice. As you can see, it's mostly neutrals. These range from dark browns to light ones; some are more caramel-y and golden, while others are more like true browns, chocolately and darker. However, in addition to those neutral shades, there are also a few colours for some different looks. There are a few shades I would call burgundy, a deep blue, and a baby pink. This makes the palette very versatile, as you could turn to it for both neutral looks and something more colourful. There are two highlight shades, one matte, one shimmer. This shades could be used as face highlight on the cheekbones for example, or an an inner corner highlight to make your eye looks pop. All of the shades look different to me, which is good because no one likes repeats in their palettes! I am impressed with the shade variety. When swatching, I found some shades were a nicer texture than others, although I can't really comment on any issues until I actually get to applying them! Here are my swatches from the top row of the palette. I will talk about these shades in the order they appear in the palette, starting from the bottom swatch to the top one. Gilded Ganache - this shade is a very very dark brown. It looks almost black in the palette but swatched brown. To me, it seems to have a slight green shade to it. The shadow is shimmery, and to me it felt sort of gritty on my finger but when I swatched it went onto my arm smoothly, so I don't know why it felt like that on my finger! White Chocolate - this is a matte, warm white shadow. In the photo, it looks like it's not pigmented, but I think that's because my skin literally looks white in some places. In person it appeared more pigmented. It went on very smoothly, and feels easy to blend. Milk Chocolate - this is a light brown matte shadow. I loved how his felt - it was so smooth and 'buttery' (I hate that description for eyeshadows but it's the only word that really fits!) and glided onto my finger and arm very nicely. It has a good colour payoff. Black Forest Truffle - in some lights, this looks burgundy, but in others it looks dark brown. Whatever colour it is, it's shimmery! As with Gilded Ganache, this felt slightly gritty on my finger, but smoothed out on application to my arm. A nice plus for both shades, the glitter lasted in my swatches and didn't just disappear. Triple Fudge - this shade is similar to Gilded Ganache; I'd say it's possibly a matte version of that shade. As with the other matte shades, it was nice and smooth to apply, and very pigmented. I will talk about my swatches from the middle row of this palette in the same order: from bottom to top. Salted Caramel - This is a very warm-toned medium to light brown. It's matte, and applied smoothly with excellent pigmentation. Marzipan - I loved this shade. It's looks to me like a shimmery version of Salted Caramel, with a bit more pink. It swatched lovely - it felt 'buttery (still hate the word) on my finger and arm, and the colour payoff was excellent. The shimmer applied very well as well. Semi-Sweet - this is a medium brown shade with a matte finish. I didn't think it was as pigmented as some of the others, but it was just as smooth to apply. I think the colour is perfect to use in transition. Strawberry Bon Bon - I'm not too keen on this colour if I'm honest. I don't really know when I'd use a baby pink, especially when I can't really see it working fabulously with anything else in this palette. It felt sort of chalky to me - nowhere near as smooth as the other matte shades. Maybe I'll challenge myself to pan it to use it all up as soon as I can! Candied Violet - recently on Pinterest I've seen a few looks using this shade, so I'm actually excited to try it out. It didn't feel as smooth to apply as some others, and I was surprised to see that it slightly changed colour from what's in the pan - the pan shade looks blue, but swatched it looks like a grey with a touch of blue. I'll still be able to make it work. Ameretto - This was another shade I loved. It is smooth to apply, has a good amount of shimmer, and is a lovely warm mid brown shade. I see this working well with Semi-Sweet. I was impressed by the pigmentation. There wasn't a shade I didn't like with in the bottom row. Once again, I'm talking about them from bottom to top. Hazelnut - A shimmery mid brown, this was lovely and smooth on application, with a good amount of shimmer and excellent pigmentation. Creme Brulee - This is a shimmery light brown, with more of a gold tone than any of the other shades in this palettes. Once again this was smooth and pigmented, and I felt the shimmer in this one really shone, as you may be able to tell from the picture. Haute Chocolate - This is a shimmery medium brown. It lost a bit of pigmentation when I swatched it, but nothing drastic. Again, it felt smooth, and it had good shimmer, though not as much as I felt Creme Brulee had. Cherry Cordial - This is a matte burgundy shade. It was pigmented, but had a slightly different colour - it looks more red in the pan and more brown when swatched. This was disappointing because I love my burgundy, but there was still a bit of red in there and I will still get a lot of use out of it. Champagne Truffle - This is a shimmery highlight shade. It has a bit of a pink tone to it which I like, because I think just white can appear quite harsh sometimes. It was very pigmented (this might not be obvious in the photo) and was nice and shimmery. Overall, I am very happy with my new palette. It lived up to my expectations for the most part and feels very high quality as well. I think a few things need a bit of improvement, but I will form a more detailed opinion on that when I actually get to using it. My first impressions are very positive, and I hope you've found this helpful! Expect a few tutorials using this palette in the coming weeks, as I very much excited to get to work with it! Thank you for reading. What do you think of the Too Faced Chocolate Bar palette? Do you agree with my opinions on it or not? If you have any looks using it, please share a link below!